Are these Calipers still available (from any source?) If not, is there some kind of conversion kit available to change stock units over into something more easily attainable? I'm having a tough time locating calipers or even caliper rebuild kits. Cunifer Brake Hardline Kit For Your 2002 (1969-1976). What diameter tubing are you using? Great looking car. I like your roof rack! Was it hard to find? Also, who do you go to for brake parts? What kind (& size) rims and tires are on your car? I like the way they look. I broke the castle nut holding down the tie rod ball joint on my '69 1602. Where can I get a replacement (Google turned up nothing.) I'd hate to have to buy a new tie rod ball joint assembly just to replace one nut! Any ideas? Does anyone have an extra? Is there a cross reference available such that I could take one off something like a 70's era VW Bug? 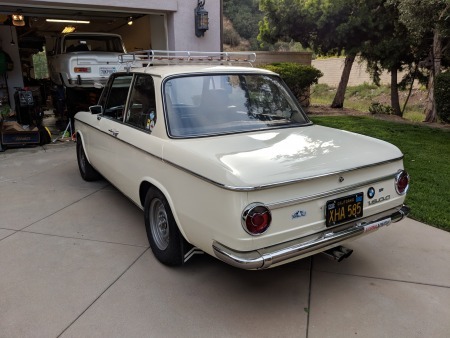 (There are not a lot of old BMW 1602's clogging up Connecticut junkyards!) Please advise. Thanks. PS I hope to get to Lime Rock this weekend, hurricane or not! !